Are there pockets of clutter in your home that are dragging you down? Find it hard to let go of clothes in case they come back into fashion or you lose or gain weight? Feel guilty getting rid of things that were given as gifts? As I prepare for my upcoming move back to London, I’m in major ‘get rid of clutter’ mode. When we packed up and moved to Madrid six years ago I donated dozens of bags filled to the brim to our local charity shops. 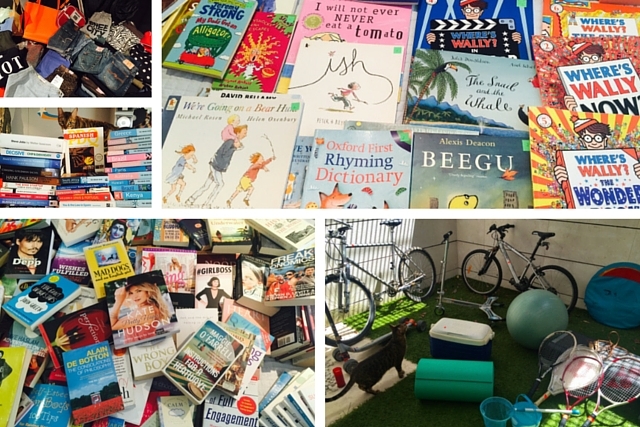 I gave away piles of books, clothes, baby and household items as I had no time to organise a sale or figure out eBay. It was amazing to start fresh in a new house. After unpacking I was delighted to find empty shelves and plenty of drawers to spare. So how is it that just six years later we’ve amassed so much stuff again? I’m finally reading The Life Changing Magic of Tidying by Marie Kondo after previously writing it off as being a book about precision folding and talking to your socks. Well, there is some of that, but the deeper underlying message is actually a good one. Only keep things in your home that spark joy. This is of course easier said than done, but in the spirit of another fresh start, I’m giving her KonMari Method a go. I followed her guidelines for sorting through our possessions in a meticulous order, not room by room, but by gathering all like items together in one place. This turned out to be very effective as I could see just how many of a certain type of thing we have. For example, vases. I gathered each and every vase or vase-like vessel in the entire house and arranged them on my kitchen table, including those hiding away in our basement or displayed on high shelves. This made it easy to eliminate those that are a similar size. 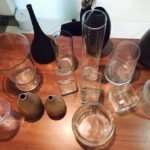 Then I used her KonMari Method of picking up each of the remaining vases and asking, ‘Does this spark joy?’ Empty vases don’t spark a lot of joy for me. Out of 16, I’m keeping five. Out of 33 I’m keeping 19. And they all have lids! Progress, right? 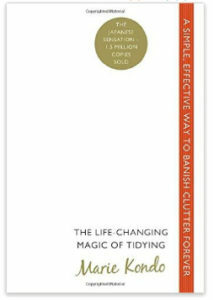 Kondo’s book helps with the emotions around decluttering, such as what to do with things other people have gifted you or how to get rid of something that has sentimental value but is no longer sparking joy. It’s easy to pass on clothes my kids have outgrown, but my own clothes are always tricker. This is where her method really kicked in for me. Instead of surveying my clothes from inside the wardrobe and drawers, I had to start with tops and take them all out and put them on the bed. Wow. Seeing how many tops, sweaters and t-shirts I have was an eye opener. Holding each one in my hand I asked, ‘Does this bring me joy?’. This showed me how many things either used to bring me joy (in which case I thanked it for the joy it brought me and moved it to my ‘get rid of clutter pile’.) or how many things never really brought me joy. Expensive mistakes, killer heels, scratchy fabric. Instead of thinking that I might wear them again one day, I was ruthless about letting things go. I took her advice to start the process in the morning when my mind was fresh and I felt strong and decisive. I worked through the rest of my clothes in the prescribed order and when I got to my socks, underwear and bra drawers I was able to chuck out most of it. Why was I hanging onto ill-fitting bras, teeny thongs and shrunken socks? I smile now when I open my drawers and wardrobes and see only the things I want to wear. My clothes have breathing space and that in turn makes me breathe easier! This process takes devotion and I’ve blocked off chunks of time every couple of days so I can get through the whole house and not lose momentum. It helps that I have a deadline coming up – my big moving-the-country sale at the end of this week. I wrangled a bit with the idea of selling vs donating and finally compromised on a 50/50 split between us and a great charity here in Spain called Fiet Gratia that helps women who are forced into prostitution. It’s shocking and sad to learn that Spain has become one of the top countries for human trafficking and I want to give something back to the country that has given us such a great life for six years and where I plan to return one day. It also warms my heart to imagine giving our stuff a new lease of life. Shedding books has been a rather emotional ride for me, especially the children’s story books. So many sweet memories of them sitting on my lap every single night before bed for years. We’ve kept several that I’m not ready to let go of, but the amount of teen and tween fiction books we’re selling is astonishing. My hubby and I are ready to share our books with others too, so we’ve turned our ping-pong table into an incredible bookshop. 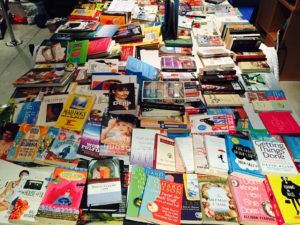 Just this week I stumbled across a blog post written by someone else who’s using The Life Changing Magic of Tidying to get rid of books and is finding it really emotional. For some reason I’m feeling okay about drastically reducing my collection, but do read this if you’re struggling. 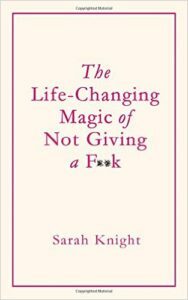 I’m not feeling any particular ‘life changing magic’ yet because it’s all still inside of my house, but I’m sure I’ll feel emotionally lighter once it’s gone! Once we’re in our new house I plan to use her method of having a set place for everything and always returning things to their place. Kondo says this is the key to not having to constantly tidy – which sounds good to me. If only I can get the rest of my family on board. I worked with a client last week to help her Master Her To-Do List. 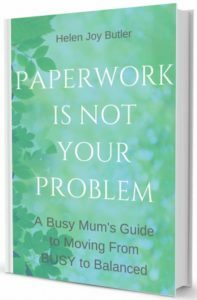 Her biggest struggle is living in a cluttered house and feeling utterly overwhelmed and paralysed with where to begin. After digging deep she got to the bottom of her problem. Her own mother was a neat freak who cared more about a tidy house than giving her kids love and affection. She vowed not to be like her mother, but the clutter in her home drags her down so emotionally that she’s not actually being the mother she wants to be. Her realisation from our session is that it doesn’t have to be one or the other. She can get rid of clutter and still heap loads of love on her kids. I’m excited for her to experience the emotional freedom that will come from finally getting on top of this. Here’s an inspirational story about my own mother who gave up all material possessions to live a life on the road doing volunteer work in exchange for room and board. It’s a very extreme example, but one we can all learn something from: Less Things = More Freedom. Also check out Helen’s Facebook page and new website which focuses more on creating a peaceful sanctuary at home to nurture and support you. And if the KonKari method feels too hard-core for you, maybe you’ll like this one better? Heh heh! In the comments below, share your thoughts. Where are your clutter hot-spots? How do you get rid of clutter? Have you got a success story to share? Let’s get the conversation flowing. We can all help each other. I’ve heard so much about that book but like you, I decided it wasn’t for me when I heard about the Japanese style folding! Now that I’ve read your review, I think I’ll give it a chance. I need some kind of a step by step method to get me started. Drowning in clutter! I accept your challenge and will start with a big box. Thanks as always for another inspirational post Kelly. I look forward to your newsletter every Monday to see what new insight you’ve got for us! Challenge accepted! I also need to going on this. I know I’ll feel emotionally lighter once I get rid of so much of what we don’t need. It definitely weighs me down. Working on the challenge. Starting in the playroom! Love this! Definitely have to give it a go. Great article Kelly! It’s wonderful to see you making such a difference in your home, knowing you won’t be taking unwanted stuff with you when you move. Thank you also for sharing my book – what a wonderful surprise for me! Ooh yes I’ve done this with my kids’ clothes. 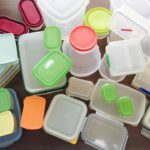 And yes, I can totally relate to the Tupperware conundrum (as if those lids will ever actually turn up lol!). Such a good idea to get all like items together just to see how much we already have. I need to get started with my vases! Hi Fiona! I hear you on the nostalgic items. I have a whole box of Barbies and Little House on the Prairie books I’d been saving for my daughter. But I have two sons instead! (And a grandson now too!) But after saving them for these many decades, how can I get rid of them now. I’m holding out for a granddaughter…. So don’t beat yourself up over those types of deeply personal possessions and give yourself great credit for shedding all of that stuff that doesn’t spark any joy. Like those 30th b-day banners! !